Feel confident your vehicle is secure on your trailer when using Starrr Products Tie-Downs. Starrr Products has been manufacturing tie-downs for over 15 years! 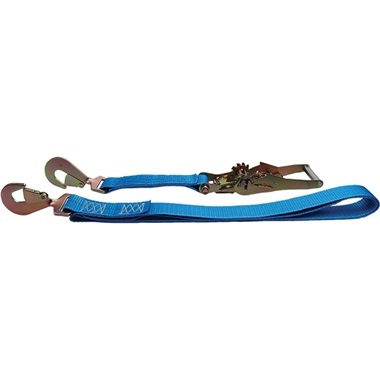 All tie-downs are Made in the USA with carbon steel, heat-treated, and plated hooks for long life. All have label showing size, max load, and WLL (working load limit). The WLL is 1/3 of the maximum load. "Always use the WLL when selecting your tie-downs." For use with Axle Straps and Tie-Backs. 2" x 8' - 10,000 lb (3,333 lb WLL) Ratchet Tie-Down with Twisted Snap Hooks. Made in USA.